The Pocket Folders are Here! As a designer, there is nothing more exciting than seeing the “hot off the press” copies of your designs. I am so excited to see the ModernJen pocket folders! I have to give a big thank you to my partner Roaring Spring Paper Products for the excellent quality of these folders. The colors really pop and the suede-feel finish is exactly what I was envisioning. The pocket folders come in 3 designs, just like the coordinating journal/notebooks: Chevron, Polka Dot or Geo. If you are a college or retail store owner, call Roaring Spring Paper Products for details about carrying these in your retail store (or contact me and I’ll be happy to forward your contact information). Otherwise, watch for these in retail stores in late 2014 or Spring 2015. 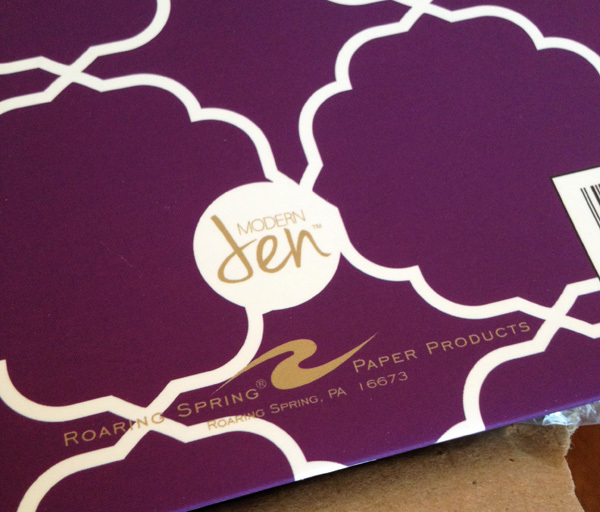 ModernJen pocket folders have a beautiful suede-feel finish in bold patterns. The ModernJen collection is sold mostly through College Bookstores. If you are looking to sell the product through a store you own or run, please contact Roaring Spring Paper at rspaperproducts.com. Or, if you would like to purchase the folders through a retail location, please send me your city and state or province and I will try to locate a store near you or online. Thank you so much for your interest. How can I order the chevron folders?